Magna Carta is a fundamental document in the history of the common law, in the United Kingdom, the Commonwealth countries, and the United States. Magna Carta "the Great Charter” is a charter of liberties signed by King John of England (1166-1216) at Runnymede on 15 June 1215. Originally drafted by the Archbishop of Canterbury in attempt to ameliorate tension between the unpopular King and his chief vassals, the feudal barons, it promised the protection of church rights, protection for the barons from illegal imprisonment, access to swift justice, and limitations on feudal payments to the Crown. Although the original charter was annulled by Pope Innocent III, the regency government of John's young son, Henry III (1207-1272), reissued the document in 1216. In need of funds, Henry reissued the charter again in 1225 with further concessions, in exchange for the approval of additional taxes. His son, Edward I (1239-1307), repeated the exercise in 1297, when Magna Carta became part of England's statute law. A final version of the document with minor changes was issued by Edward I in 1300 to insure the military and financial support of the barons against the Scots. Magna Carta continued to function as a political tool for centuries – both for the crown and for opposition to the crown. Later, as a more coherent interpretation of the common law became necessary, Sir Edward Coke (1552-1634) and John Selden (1584-1654) were among the first to return to Magna Carta as a cornerstone of English liberty. A century later, Sir William Blackstone (1723-1780) published the first critical edition of the 1215 Charter in 1759, and gave it the numbering system still used today. Blackstone is credited with including the text in modern legal theory, and he chose it as a source for his Commentaries on the Laws of England, which is still cited today. In the nineteenth century outdated clauses began to be repealed in the United Kingdom. The first repeal was in 1829, and over the next 140 years, nearly the whole charter was repealed. Only clauses 1, 9, and 29 were still in force after 1969. Four of the original thirteen copies of the 1215 charter survive, two held by the British Library and the others by cathedrals of Lincoln and Salisbury. Copies of the 1216, 1217, 1225, 1297, and 1300 versions are also scarce. Only two official manuscript copies of Magna Carta are held outside England, both from 1297. One is in Australia, on display in the Member’s Hall, Parliament House, Canberra, and the other resides in the United States on permanent loan to the National Archives, courtesy of David M. Rubenstein. 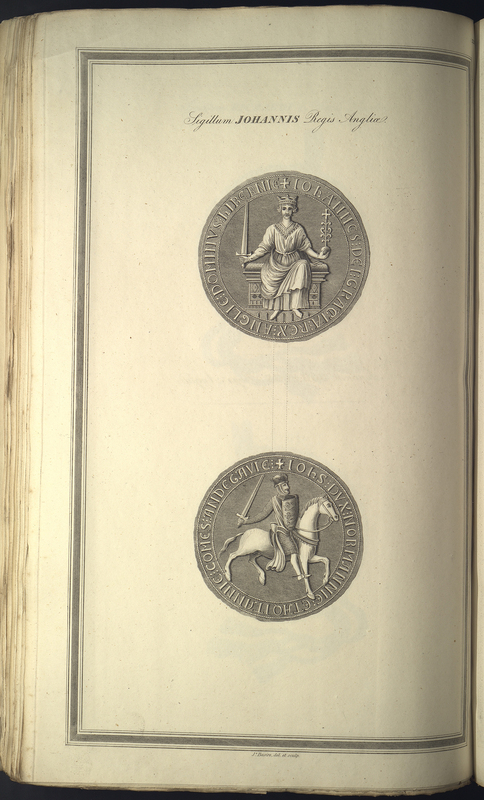 Engraving of King John's seal. Appendix to Reports from the Commissioners: Appointed by His Majesty to Execute the Measures Recommended by a Select Committee of the House of Commons Respecting the Public Records of the Kingdom. [London : Printed by G. Eyre and A. Strahan, printers to the King, 1820]. Plate XLVI. Engraved By James Basire.